Are you tired of fad diets and exercise plans that don't produce the goods? Want a simpler way to achieve all-round fitness and well-being? The human body is a machine. Like any other machine, it needs fuel and regular maintenance. Feed it with the wrong fuel and it won’t run; and unless you maintain it properly, it’ll eventually break down. It’s important to make sure you take care of both of these crucial areas. And you can learn to do exactly that in just a few hours – with help from hypnosis. 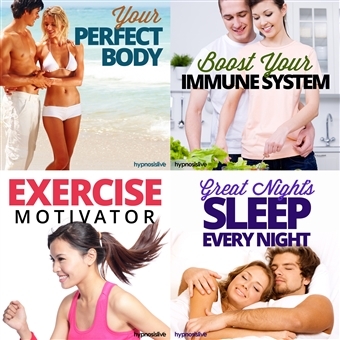 The four health-boosting sessions in the Healthy with Hypnosis Bundle will help you get rid of bad habits, rejuvenate your body and mind, adopt a healthier lifestyle, and find the willpower to sustain it for good. Recognize the perfection you have already attained. Reprogram your mind with new habits to seek a healthy lifestyle and enjoy your body. Appreciate being in your unique and amazing body as you get healthier and happier, each and every day. Set yourself on a one-way course to an improved immune system. This session will help you rebuild, strengthen and maintain your inner defenses. Within days your immune system will be recharged, giving you the power to tackle life with renewed energy and resistance. Set your immune system on fire! Wake up with the motivation to hit the gym and to enjoy the surge of endorphins you feel when you run, cycle, lift weights, swim, or stretch. Develop new healthy habits so you want to get out of bed every morning just to exercise. You’ll soon start to feel and see the difference that even a little exercise makes. Overcome insomnia, relax your body and mind, and get a full night of deep sleep that rejuvenates your entire being. You’ll fall asleep easily by relaxing every muscle in your body and washing away the day’s anxieties. You’ll switch off mental loops and obsessive thoughts, and be able to nod off quickly and effortlessly. Download The Healthy with Hypnosis Bundle now to treat your body to a host of healthy habits to make it positively thrive. Enjoy More Wellbeing and Vigor, with Hypnosis!